The proto-oncogene c-Met encodes the high-affinity receptor tyrosine kinase (RTK) for hepatocyte growth factor ( HGF ), also known as scatter factor (SF), a pleiotropic cytokine that conveys a unique combination of pro-migratory, anti-apoptotic and mitogenic signals. Met and HGF are widely expressed in a variety of tissues. The expression of Met (the receptor) is normally confined to cells of epithelial origin, while the expression of HGF (the ligand) is restricted to cells of mesenchymal origin in an almost perfect paracrine paradigm. The transduction of signaling and subsequent biologic effects of HGF by Met has been shown to be important in epithelial–mesenchymal interaction and regulation of cell migration, invasion, cell proliferation and survival, angiogenesis, morphogenic differentiation, and organization of three-dimensional (3D) tubular structures (e.g. renal tubular cells, gland formation, etc.) during development and tissue repair. HGF-null-mice are embryonic lethal due to defects during the development of epithelial organs. For its properties, Met acts as a powerful expedient for cancer dissemination. Met can also be genetically selected for the long-term maintenance of the primary transformed phenotype, and some tumours appear to be dependent on (or “ addicted ” to) sustained MET activity for their growth and survival. Because of its dual role as an adjuvant, pro-metastatic gene for some tumour types and as a necessary oncogene for others, Met is a versatile candidate for targeted therapeutic intervention. 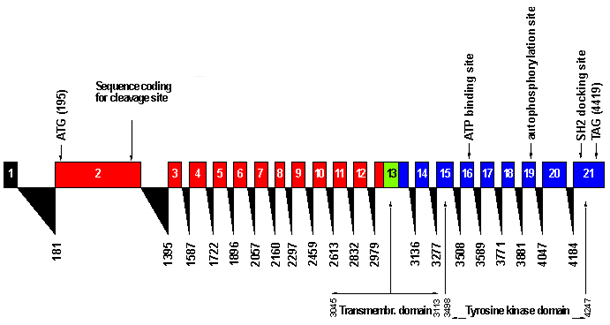 C-Met proto-oncogene has a total length of 125,982 bp, and it is located in the 7q31 locus of chromosome 7. Met is transcribed into a 6,641 bp mature mRNA, which is then translated into a 1,390 amino-acid Met protein. Hepatocyte growth factor ( HGF ) is secreted as a single-chain, biologically inert precursor and is converted into its bioactive form by extracellular proteases, which cleave the bond between Arg494 and Val495. The mature form consists of an alpha- and a beta-chain that are held together by a disulphide bond. The alpha-chain contains an N-terminal hairpin loop (HL) followed by four peculiar domains known as kringle (K) domains (80 amino acid double-looped structures formed by three internal disulphide bridges). The beta-chain is homologous to serine proteases of the blood-clotting cascade, but lacks proteolytic activity owing to amino acid substitutions in the catalytic site. Met is a single-pass, disulphide-linked alpha/beta heterodimer that is formed by proteolytic processing of a common precursor in the post-Golgi compartment. The extracellular portion of Met is composed of three domain types. The N-terminal 500 residues fold into a large Sema domain , which encompasses the whole -subunit and part of the -subunit, and shares sequence homology with domains found in the semaphorin and plexin families. The Sema domain is followed by a PSI domain – also found in the plexins, semaphorins and integrins, hence its name – that spans about 50 residues and contains four disulphide bonds. The PSI domain is connected to the transmembrane helix via four IPT domains , which are related to immunoglobulin-like domains and are named after their presence in plexins and transcription factors. The intracellular portion includes tyrosine kinase catalytic sites flanked by distinctive juxtamembrane and carboxy-terminal sequences. Phosphorylation of Tyr1234 and Tyr1235 within the catalytic site positively modulates enzyme activity, whereas phosphorylation of Ser975 in the juxtamembrane segment downregulates kinase activity. The carboxy-terminal tail includes two critical tyrosines (Tyr1349 and Tyr1356) that, once phosphorylated, act as a promiscuous docking site for the recruitment of several transducers and adaptors. Met transcription is activated by HGF and several growth factors. Met promoter has four putative binding sites for Ets, a family of transcription factors that control several invasive growth genes. ETS1 activates Met transcription in vitro; Met transcription is also induced by hypoxia-inducible factor 1 (HIF1 ), which is activated by low concentration of intracellular oxygen. HIF1 can bind to one of the several hypoxia response elements (HREs) in the Met promoter. Hypoxia also activates transcription factor AP-1 , which is involved in Met transcription. The coding sequence (4173 bp) is represented as red boxes (exons coding for the extracellular domain), blue boxes (sequence coding for the intracellular part) and a green box (coding for the transmembrane domain). Black triangles indicate the splicing sites. Alternative splicing: Two variants were described and presumed to be generated by alternative splicing. Isoform A :This variant represents the longer transcript and encodes the longer isoform. Isoform B : This variant uses an alternate in-frame splice junction at the end of an exon compared to variant A. The resulting isoform has the same N- and C-termini but is shorter. Ligand-dependent downregulation of the activated receptor is an essential negative regulatory mechanism preventing receptor oversignaling. Upon ligand binding, Met is polyubiquitinated and then degraded; a complex involving endophilins, CIN85 and Cbl controls this process. Endophilins3 are regulatory components of clathrin-coated vesicle formation. Through their acyl-transferase activity they are thought to modify the membrane phospholipids and induce negative curvature and invagination of the plasma membrane during the early steps of endocytosis4. Furthermore, by means of their Src-homology 3 domains, endophilins are able to bind CIN85, a recently identified protein that interacts with the Cbl proto-oncogene5. Cbl(gene) , in turn, binds and ubiquitinates activated HGF receptor, and by recruiting the endophilin–CIN85 complex, it regulates receptor internalization. Inhibition of complex formation is sufficient to block HGF receptor internalization and to enhance HGF-induced signal transduction and biological responses. Proapoptotic function of the MET tyrosine kinase receptor through caspase cleavage(23)%3A10328-39. Down-regulation of Met signaling also involves proteolytic cleavages. Met is cleaved by caspases, which separate the extracellular ligand-binding domain from the intracellular kinase domain. In addition to abolishing the ligand responsiveness of Met, these cleavages generate a cytoplasmic proapoptotic fragment named p40 Met, involved in apoptosis amplification. The invasive growth triggered by Met occurs in physiological conditions both during embryonic development and organ formation, and in adult life. During embryogenesis , Met/HGF have a role during complex developmental events such as gastrulation , epithelial morphogenesis, angiogenesis , myoblast migration, bone remodelling and nerve sprouting. Indeed all these events require cell proliferation, migration, escape from apoptosis, invasion of surrounding tissues and reorganization into new structures. In example is demostrated that HGF provides spatially defined chemoattractant-like motogenic signals for the migration of myogenic precursor cells, or that it functions as an axonal chemoattractant for spinal motor neurons and also plays a crucial role in the development of sensory, sympathetic, parasympathetic and cortical neurons and in the regulation of the proliferation/differentiation of oligodendrocyte progenitor cells. During adult life , epithelial cells exploit the invasive growth program for wound healing during acute injury repair when cells at the wound edge proliferate and migrate to regenerate tissue integrity. The physiological roles of the HGF-Met pathway in protection, regeneration (it functions as a humoral hepatotrophic factor), anti-inflammation and anti-fibrosis of the liver cannot be substituted by other growth factor, cytokines and bioactive molecules. Similar to the role of HGF-Met in the liver, the involvement of the HGF-Met pathway in tissue protection and/or regeneration has been demonstrated in different tissues, though the dependency on the HGF-Met pathway is different depending on tissue types. The HGF-Met pathway supports the protection and regeneration of kidney, lung, nervous system, cardiovascular, cutaneous, and gastrointestinal tissues. Collectively, the HGF-Met pathway plays definitive roles not only by promoting survival, proliferation, migration, and 3-D morphogenesis but also in preventing inflammation and fibrotic change in tissues. Binding of activated HGF to the Met extracellular ligand-binding domain results in receptor dimerization and phosphorilation of multiple tyrosine residues in the intracellular region. Tyrosine phosphorilation at the Met juxtamembrane, catalytic, and cytoplasmic tail domains regulates the internalization, catalytic activity, and docking of regulatory substrates, respectively. • signaling through an adaptor protein, shared also by EGFR and IGFR , Gab-1 , that has been demonstrated to mediate most of the biologically relevant Met-dependent signals. PTEN(gene) (phosphatase and tensin homolog) is a tumor suppressor gene encoding a protein PTEN, which possesses lipid and protein phosphatase-dependent as well as phosphatase-independent activities. PTEN protein phosphatase is able to interfere with Met signaling by dephosphorylating either PIP3 generated by PI3K, or the p52 isoform of SHC. SHC dephosphorylation inhibits recruitment of the GRB2 adapter to activated Met. There is evidence of correlation between inactivation of VHL (Von Hippel-Lindau) tumor suppressor gene and increased MET signaling in renal cell carcinoma (RCC). Met is expressed by most carcinomas and its elevated expression relative to normal tissue has been detected in a number of cancers including lung, breast, colorectal, prostate, pancreatic, head and neck, gastric, hepatocellular, ovarian, renal, glioma, melanoma, sarcomas medulloblastomas and non-small-cell lung carcinomas (NSCLC) with acquired resistance to epidermal growth factor receptor (EGFR) inhibitors. Met can be inappropriately activated in human cancer by several different mechanisms such as deregulated ligand-dependent mechanisms, transcriptional upregulation or specific genetic lesions. The ligand-dependent activation of the receptor is known to be linked to upregulated levels of HGF in the micro-environment secreted by both surrounding stromal cells (paracrine effect) and tumor cells (autocrine). Tumor can upregulate stromal cell HGF expression through the secretion of cytokines and growth factors . Tumor cell HGF/Met autocrine loops have been reported in a number of human cancers including breast , lung, gastric, glioma , multiple myeloma , leukemias, and certain sarcomas. Recently, a somatic deletion in a DNA element upstream to the HGF promoter region, which results in increased HGF expression, has been reported in breast cancer patients. The most frequent mechanism of Met constitutive activation in human tumors is increased protein expression as a consequence of transcriptional upregulation, in absence of gene amplification. This can be due to several different mechanisms like loss of negative regulation, pathways activation in hypoxic conditions or as a response to environmental stimuli. Since the activation of Met give induce anti-apoptotic, pro-mitogenic and pro-migratory effects, the transcriptional upregulation of Met by the tumor gives a proliferative advantage to the tumor itself.The list of neoplasms in which Met overexpression has been detected is constantly increasing and, at least for carcinomas, cases of excessive levels of Met expression have been found in virtually all types of this malignancy. Regarding c-met gene lesions, missense mutations of Met are present in the germline of hereditary papillar renal cell carcinoma families implicating Met in the genesis of the desease. Moreover, kinase domain mutations have been observed in sporadic papillary renal carcinoma , ovarian cancer , and childhood hepatocellular carcinoma , while juxtamembrane domain mutation were observed in gastric and lung cancer . Another genetic lesion is the amplification of c-met gene locus that finally leads to overexpression of the Met receptor. Amplification of the Met locus can be a genetic marker of the primary transformed phenotype or a secondary occurrence capable to influence the subsequent steps of neoplastic progression. As an example, in some cases of colorectal carcinomas Met was found to be amplified in hepatic metastasis but not in primary tumors, pointing out the role of Met in metastatization. c-met gene amplification as primary genetic lesion is a rare event, but several papers demonstrated that, upon treatment of EGFR mutated tumors with inhibitors specific for EGFR, the tumor acquires resistance to this inhibition by amplification of Met gene. This amplification is demonstrated to be both the expansion of a pre-existing population or a new mutation in the tumor DNA.